Our spiked leather collar has 1/2 inck long solid steel nickel plated spikes that are permanently set with brass rivets. This leather collar is 2 inches wide and tapers to 1 inch wide at the buckle. 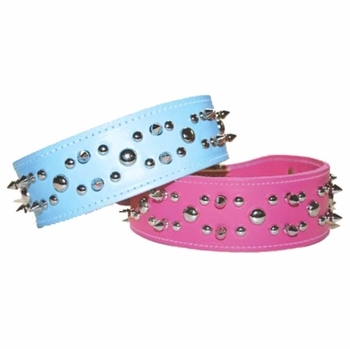 This collar is available in Baby Blue, Pink, Red and regular Blue and in sizes 21, 23, 25, 27 and 29. Size 21 fits a 16 to 18-1/2 inch neck. Size 23 fits a 18 to 20-1/2 inch neck. Size 25 fits a 19-1/2 to 22 inch neck. Size 27 fits a 21-1/2 to 24 inch neck. Size 29 fits a 23-1/2 to 26 inch neck.